Yesterday I spent the morning in the commercial kitchen making pineapple jam and apple earl grey jelly. I am preparing for the Withrow Market but also needed to fill a few orders that came in over the week. On days where I spend a lot of time making preserves or jams, etc for others, I like to balance things out by making something new for myself. Generally something I have never made before. It helps to keep the love alive if you know what I mean. 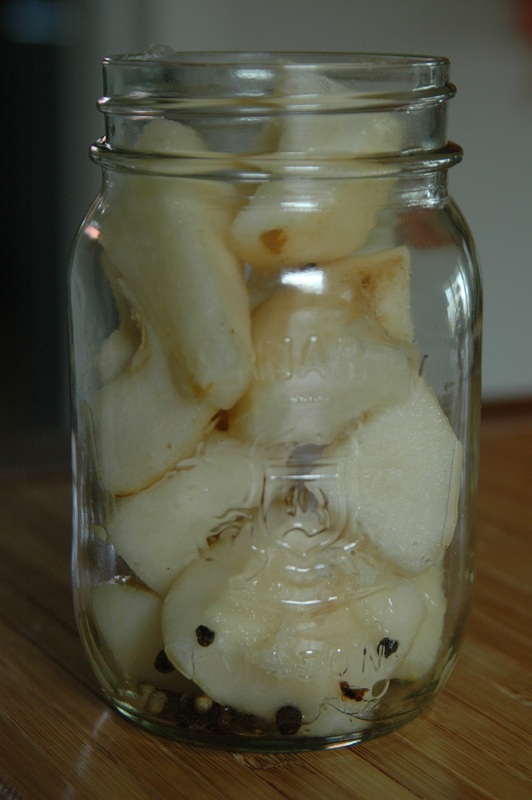 I had bought some pears at the market earlier this week and was originally thinking to preserve them with ginger which is something I have done before in the past. But I was really looking for something altogether different and my recent affair with Aigre-Doux needed a little more exploration. 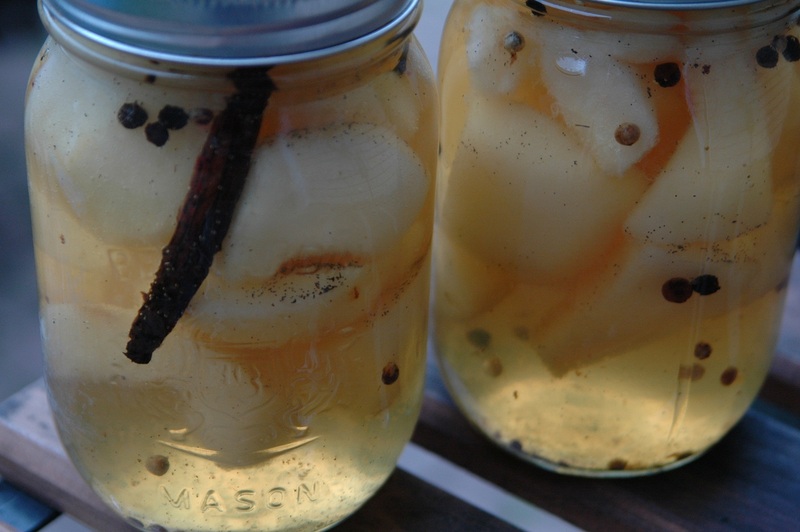 So when I came across the recipe for pear and vanilla aigre-doux, I knew I had found my project for the late afternoon. 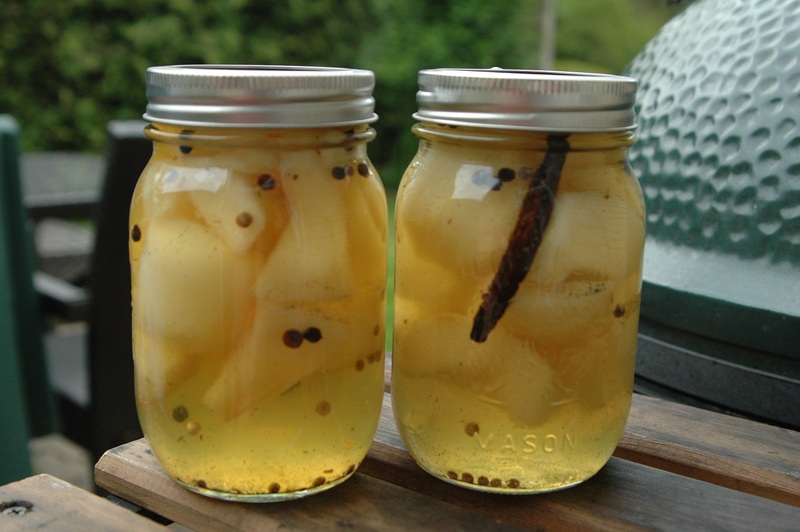 When something calls for pears, white wine (I used Gewurztraminer) honey, champagne vinegar, sugar, vanilla beans and black pepper I am powerless to resist. 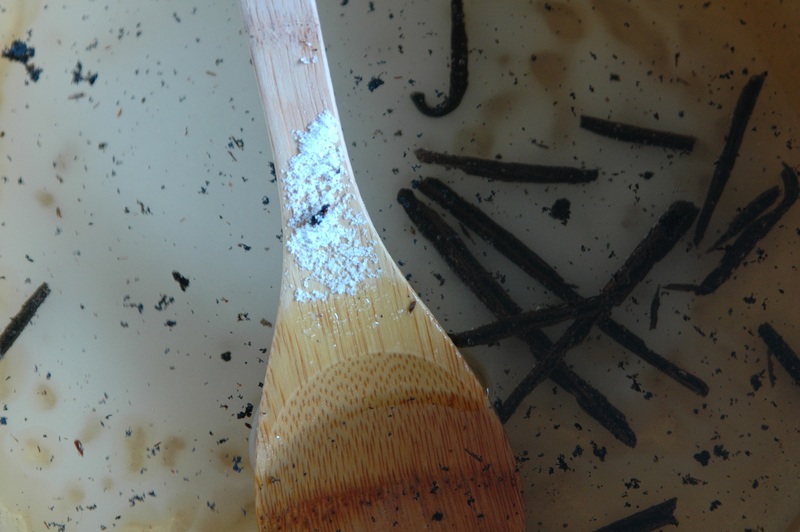 It is almost instantly gratifying as unlike jams or jellies that can take close to an hour or longer to make, the Aigre-Doux is wrapped up and in the hot water bath generally in 20-25 minutes. And once again I found myself thinking that it looks almost too good to eat, but only almost. There was a little of the aigre-doux sauce left over and I reduced it down in a medium sized pan for about 4 minutes and then let it cool slightly and drizzled it over a spinach salad with some roasted walnuts. So good. I used the Mandarin Aigre-Doux from last week as well. I drained the juice and reduced it down and then blended it with the mandarins and drizzled a little bit into some parsley soup. It was like a splash of spring in the bowl.